The University changed dramatically between 1825 and 1895. A growing student body, disease and war, and developments in teaching methods required buildings to serve new needs. 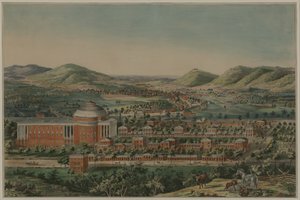 The aesthetic of the University’s architecture changed from the tightly controlled Jeffersonian classicism of the Academical Village to a picturesque placement of buildings in a wider range of architectural styles.